You can add any amounts you want. Sorry but you kind of have to wing it! Pre-heat oven to 225 or 250 degrees. 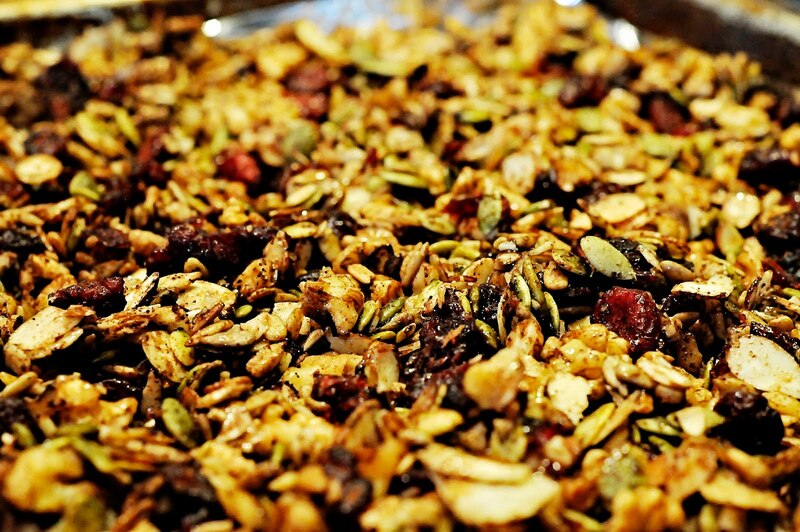 Dump all the nuts and seeds in a mixing bowl. Pour onto a foil lined baking sheet and make a single layer. Bake in 15 minute increments stirring after each 15 minutes. Bake for a total of about 45 minutes or until golden brown. Break the granola apart and place in an air tight container. Warning! Don't eat too much at one time!!!!!!! Seriously Addicting!!!! Enjoy and let me know how it turns out!!!! P.S. Coming Soon! An all about Paleo Blog! made this today, love it! I think the cinnamon makes it taste so good, and I love pumpkin seeds. I didn't have any sunflower seeds so that is how mine is different, but I'll make this again with them!